Hrmmmi door was replaced at some point . Wire wheel the battery tray, and see how it comes out . Okay, I can try that for sure. I'll pickup some primer too. There are a few spots I'd like to clean up back there. Thanks! I was just telling my GF that I feel like with the alternator replaced, interior cleaned and seats out, now I can get to the fun stuff like buying parts and tearing apart other things. I still really want to remove all of the audio/stereo aftermarket stuff though. I'm just not an audio guy. Looking at some of these other member's journals gives me something to shoot for. You guys are so detailed it's epic. I'm going to really try to approach this project in that fashion. Minor update...I'm still working on cleaning out the interior, removing audio wiring, etc. Now I'm on to the Clifford 750 alarm. In your opinion, is it worth ripping all of the alarm electrical out? 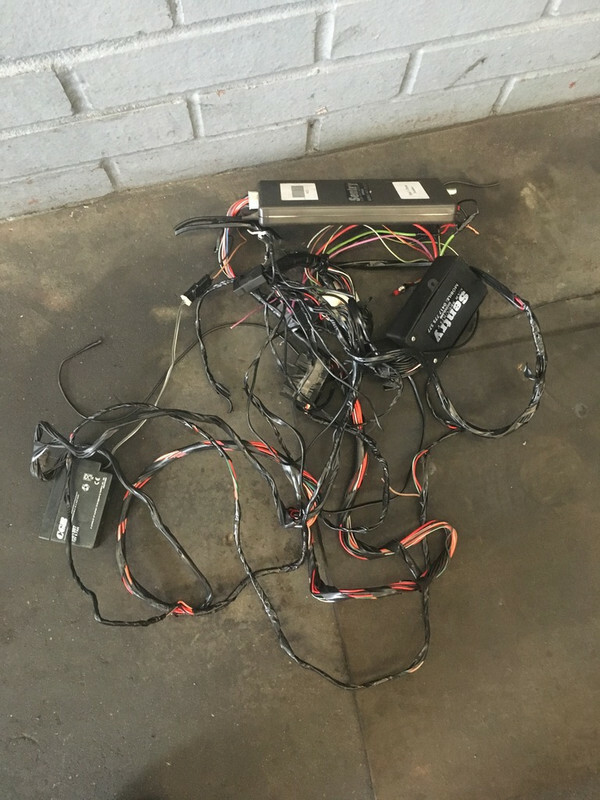 I'm not an electrical guy so my concern is, I'm sure this wires into the factory harness somehow. The last thing I want to do is to have to cut something that I'm not sure what to do with. Unless I'm wrong and most of this stuff can be simply removed and the alarm has is own, stand-alone harness. I'd love to hear your thoughts on whether or not you'd remove it or let it do nothing. It really depends how it was installed. Sometimes these things are hacked in. Theres no way of us knowing without seeing the wiring. 98 m3, techno/anthrazit cloth, 109k and officially worthless. 2000 323i touring, silver/grey/sport pack, 175k and officially boring. I'd remove any 90s spec aftermarket alarm. This is what came out when I removed mine. Ugh...I hate that. lol. I'm literally in the process of ripping out all of mine. I have it just about as far as I'm comfortable taking it since it looks like it's wired into the factory harness. I'm busy now acquiring parts..fun times! I should have an update soon once most of the interior bits show up. I'll buy the motor/trans from ya! Lol! Depending on the issues, I would think you could part that out for more than the BIN price. All times are GMT. The time now is 11:14:28 PM.